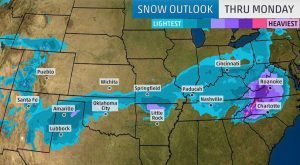 As a blizzard-like storm approaches on Thursday, a severe weather statement has been issued for the eastern U.S. Over the weekend into Monday the storm will intensify and affect multiple States. The Weather Network has issued travel warning to the Canadians – advising avoidance or cancellation of trips to South due to heavy road closures and delays. Travelling may be totally out of question and Citizens may have to experience only the Canadian winter. 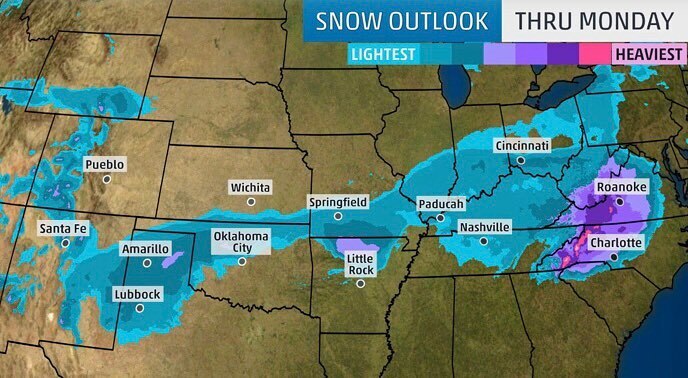 The Weather Network is alerting Canadians to avoid any travel to the U.S. over the weekend as severe weather will hit most of the southeastern States. The Weather Network has warned Canadians who are vacationing in a motor home to retreat to a safer location when, severe weather commences. Heaviest snowstorms are expected in North Carolina and Virginia, Pennsylvania, New York, and Ohio. Heavy rain and snow are going to reach the Appalachians. There could be road closures and flight delays affecting travel along the coasts of North and South Carolina, Georgia, and Florida. Canadians are advised to stay home and cancel travel plans.